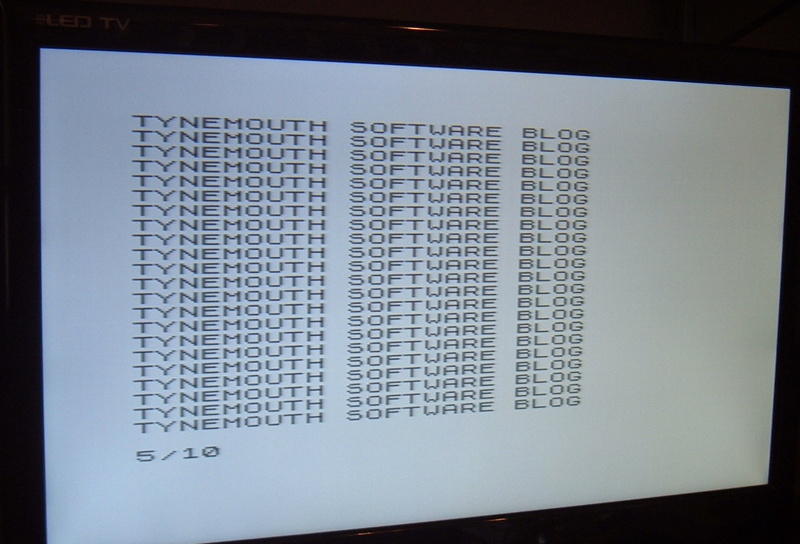 Today in the blog, I answer the age old question, "what do you get if you cross an acorn electron with a sinclair zx81?". The answer it seems, is a more usable ZX81. Whilst having a clear out, I came across two things and thought, hmm, there's a project. 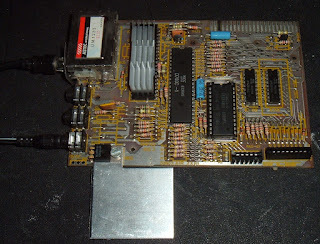 The first was a ZX81 board. 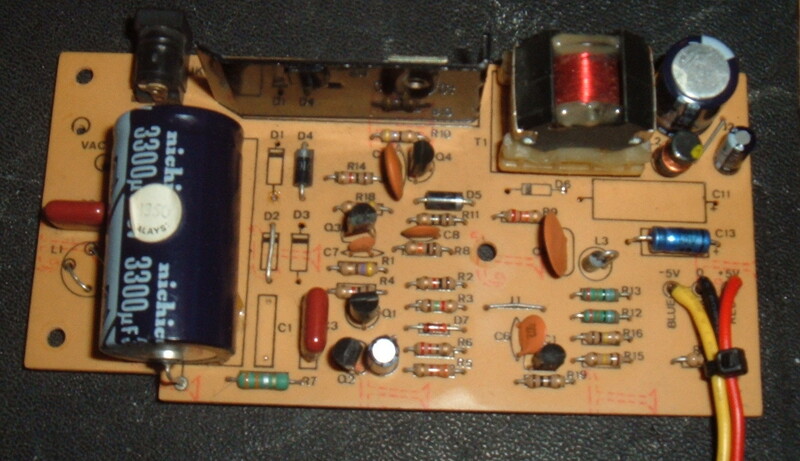 This was a working board extracted from a ZX81 which I was asked turned into a ZX81 USB Keyboard. 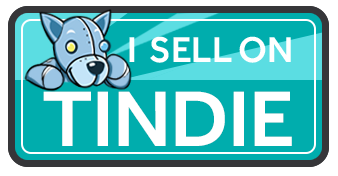 Normally, I only use broken ZX81's for this, and there is unfortunately a reasonable supply of these. The vision of Sir Clive to reduce it all down to 4 chips left CPU, ROM, RAM and 'everything else' and it is these ULA's which contain everything else that are the problem. They run hot, and when they fail, the only source of spares is another ZX81. So if the ULA goes, you just get another one and all that can be done is perhaps turn it into a USB Keyboard or a door wedge. But in this case, I was sent a working '81 to convert, I was told I could keep the board, so once tested, I put it aside knowing one day I'd find a use for it, possibly installing it in a new case with a proper keyboard. 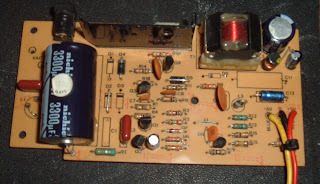 It was a slightly odd Issue 3 board, in that all the resistors were raised up by 10mm. I can only assume this was build from a kit and the builder decided that was the way to go. Very odd. The ULA has some graphics card RAM heatsinks on it to help it run cooler. The other heatsink is the standard voltage regulator hearsink, which also runs warm. This is one of the cases where 'only 4 chips' actually means 5 as there are 2 RAM chips here rather than the alternate single chip. The second thing I found was the result of a previous idea. I'd started with the premiss that you can never have enough Acorn Electrons, then argued that perhaps I had one too many. In fact, I had several with some things slightly wrong with them. One with a dirty case, one with a slightly twitchy keyboard, and one which had an intermittently faulty ULA (yes, Acorn fell for the same trick and put much of their glue logic into a single point of failure). So I shuffled things around into a pile of working electrons and one with all the bad bits. And this was what I found. The video output is through a UHF modulator and most modern TV's can't tune into it's signal. There are a number of standard mods to convert the output to composite video which most TV's can handle. The power supply. 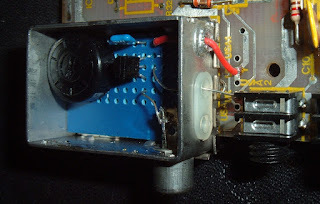 One of the old issues with the ZX81 was the power connector, and how easy it was in some circumstances to knock it and loose what you'd been working on. It also ran hot as it was a 7805 linear regulator running on 9V, so was dissipating about 4 Watts of heat. The keyboard. 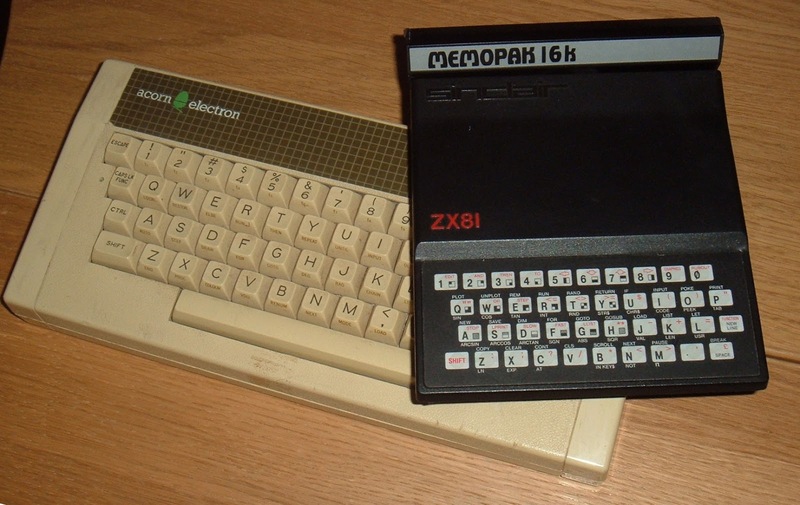 Ironically, since I'd converted a few into USB keyboards, they keyboard was a bit of an issues on the ZX81. The USB one I have on my media PC is for occasional use only (and because it looks better than an old PC keyboard). For longer term use, the membrane is a bit of a pain. RAM and storage. I bought a ZXpand a while ago and I would like to use that here. This adds 32K RAM and SD card storage, so solves both issues in one. 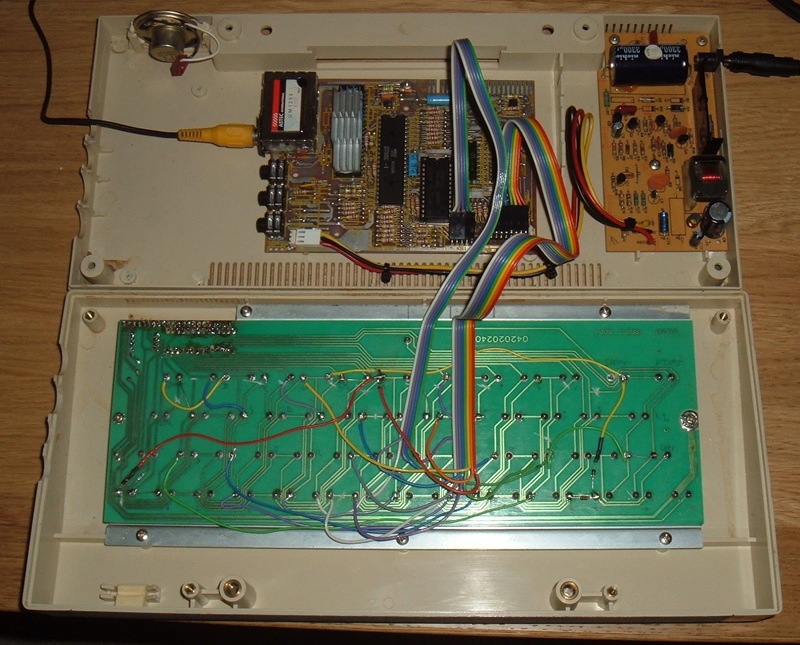 The video mod was easier than expected because this ZX81 had the later 2C210E ULA which produced a better signal (it included the back porch pulse which was missing on the earlier versions). 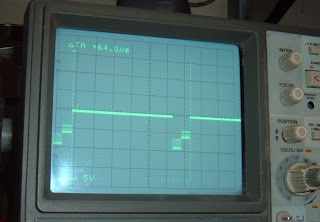 All that was required was a transistor buffer to get the signals to the right levels. As with many people, I fitted the circuit in side the modulator case. I found a bit of variation in the resistor required between a few TV's I tried. The standard circuit uses 100 ohms, but 75 ohms would be a better match for the input resistance, and indeed worked better in some cases. In the end, I installed a 220 ohm variable resistor which can be adjusted through the old tuning hole. The next challenge was the power supply. I wanted to replace the 7805 regulator as I planned to expand the system, so needed more power and it already runs hot with the standard load on. I had considered using a mains power supply, housed inside the case, but I had some issues with height, so went back to the electron supply. 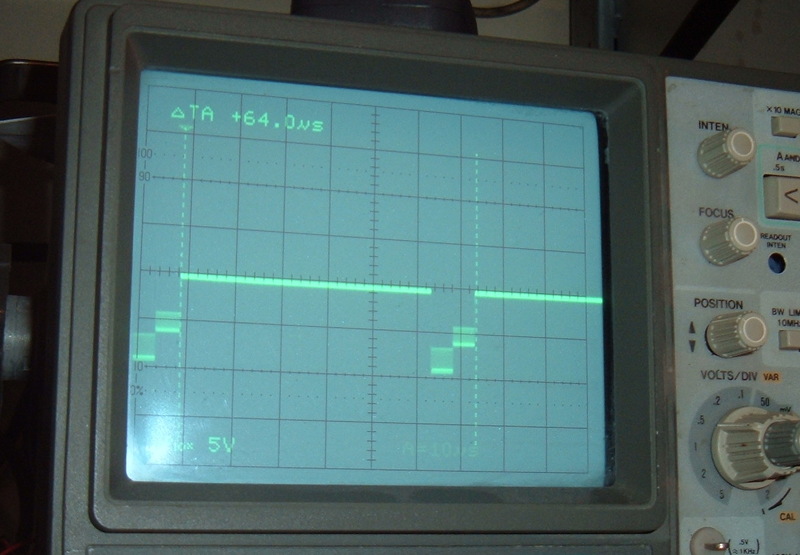 This was unusual in the it was a switched mode supply which ran from 19V AC and generated 5V and -5V. Almost right. A bit or modification, and it now runs on 12V DV and provides 5V for the ZX81 around 11V for the add odds (the unregulated DC is passed to the ZX81 expansion connector to add on units don't overload the onboard regulator). The 7805 was removed and replaced with a 3 pin connector. 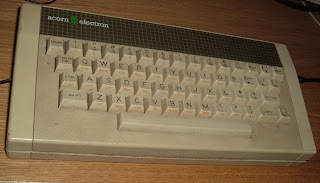 The keyboard was always going to be interesting. 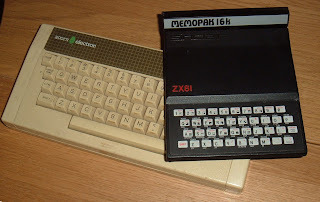 I'd looked at a few options in the past, but the way the ZX81 worked made that difficult. It has 8 rows and 5 columns, with the rows split in the middle, so 1-5, 6-0, Q-T Y-P etc. The 8 rows are actually the 8 higher address lines, and the 5 columns are inputs to the ULA. The addressing scheme meant that it was read on every other input address. So the lines were scanned by setting the higher address lines and reading the 5 inputs. Any which were pulled low were considered pressed. 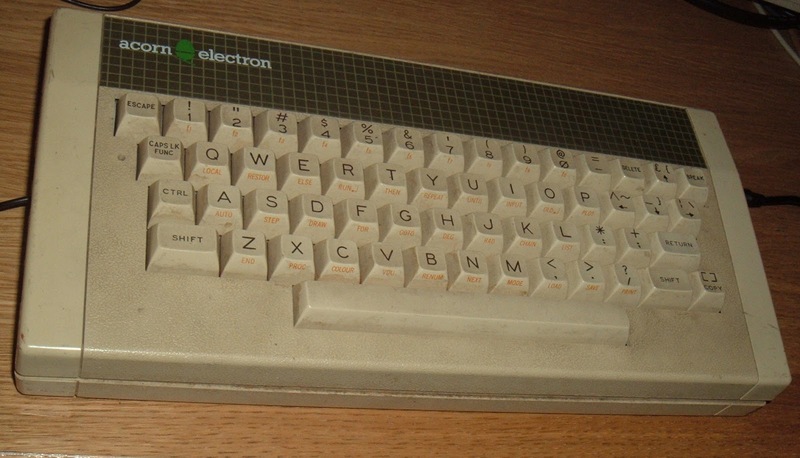 The electron was 4 lines of 16 inputs, but was made of individual mechanical switches on a single sided PCB, so it was fairly easy to cut tracks and rewire it to the ZX81's matrix. I was even able to extract things like Delete out to a separate key (it is SHIFT+0 on a ZX81 and is called 'Rubout') by using additional diodes connecting to the rows of SHIFT and 0 as they were on the same column. That's about as far as I've got. This is sort of work in progress as there are a few things to do. The ZXpand is unfortunately too big to fit in, I need to look at other options to fit it in, or just add 32K RAM on board. I also need to clean up the case, possibly spray it back, and look at making stickers for the keycaps. But as it is, it's a ZX81 with a decent keyboard, proper video out and a stable power supply. I couldn't resist a final test program, and it had to be. 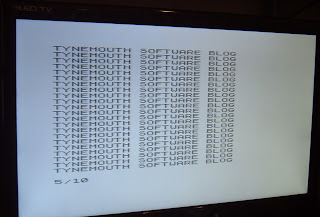 10 PRINT "TYNEMOUTH SOFTWARE BLOG"
Now, where did I put the 3D Monster Maze tape?